University of California, San Diego researchers have 3D-printed a tissue that closely mimics the human liver’s sophisticated structure and function. The new model could be used for patient-specific drug screening and disease modeling and could help pharmaceutical companies save time and money when developing new drugs, according to the researchers. The liver plays a critical role in how the body metabolizes drugs and produces key proteins, so liver models are increasingly being developed in the lab as platforms for drug screening. However, so far, the models lack both the complex micro-architecture and diverse cell makeup of a real liver. For example, the liver receives a dual blood supply with different pressures and chemical constituents. So the team employed a novel bioprinting technology that can rapidly produce complex 3D microstructures that mimic the sophisticated features found in biological tissues. The liver tissue was printed in two steps. The team printed a honeycomb pattern of 900-micrometer-sized hexagons, each containing liver cells derived from human induced pluripotent stem cells. An advantage of human induced pluripotent stem cells is that they are patient-specific, which makes them ideal materials for building patient-specific drug screening platforms. And since these cells are derived from a patient’s own skin cells, researchers don’t need to extract any cells from the liver to build liver tissue. Then, endothelial and mesenchymal supporting cells were printed in the spaces between the stem-cell-containing hexagons. The entire structure — a 3 × 3 millimeter square, 200 micrometers thick — takes just seconds to print. The researchers say this is a vast improvement over other methods to print liver models, which typically take hours. Their printed model was able to maintain essential functions over a longer time period than other liver models. It also expressed a relatively higher level of a key enzyme that’s considered to be involved in metabolizing many of the drugs administered to patients. The work was published the week of Feb. 8 in the online early edition of Proceedings of the National Academy of Sciences. The functional maturation and preservation of hepatic cells derived from human induced pluripotent stem cells (hiPSCs) are essential to personalized in vitro drug screening and disease study. Major liver functions are tightly linked to the 3D assembly of hepatocytes, with the supporting cell types from both endodermal and mesodermal origins in a hexagonal lobule unit. Although there are many reports on functional 2D cell differentiation, few studies have demonstrated the in vitro maturation of hiPSC-derived hepatic progenitor cells (hiPSC-HPCs) in a 3D environment that depicts the physiologically relevant cell combination and microarchitecture. The application of rapid, digital 3D bioprinting to tissue engineering has allowed 3D patterning of multiple cell types in a predefined biomimetic manner. Here we present a 3D hydrogel-based triculture model that embeds hiPSC-HPCs with human umbilical vein endothelial cells and adipose-derived stem cells in a microscale hexagonal architecture. In comparison with 2D monolayer culture and a 3D HPC-only model, our 3D triculture model shows both phenotypic and functional enhancements in the hiPSC-HPCs over weeks of in vitro culture. Specifically, we find improved morphological organization, higher liver-specific gene expression levels, increased metabolic product secretion, and enhanced cytochrome P450 induction. 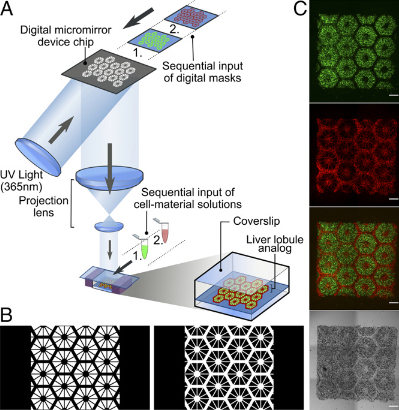 The application of bioprinting technology in tissue engineering enables the development of a 3D biomimetic liver model that recapitulates the native liver module architecture and could be used for various applications such as early drug screening and disease modeling. I wonder how equivalent are these hepatic cells derived from human induced pluripotent stem cells (hiPSCs) compared with the real hepatic cell populations. All cells in our organism share the same DNA info, but every tissue is special for what genes are expressed and also because of the specific localization in our body (which would mean different surrounding environment for each tissue). I am not sure about how much of a step forward this is. Induced hepatic cells are known, but this 3-D print does not have liver shape or the different cell sub-types you would find in the liver. I agree with your observation that having the same DNA information doesn’t account for variability of cell function within an organ. The regulation of expression is in RNA translation, and that is subject to regulatory factors related to noncoding RNAs and to structural factors in protein folding. The result is that chronic diseases that are affected by the synthetic capabilities of the liver are still problematic – toxicology, diabetes, and the inflammatory response, and amino acid metabolism as well. Nevertheless, this is a very significant step for the testing of pharmaceuticals. When we look at the double circulation of the liver, hypoxia is less of an issue than for heart or skeletal muscle, or mesothelial tissues. I call your attention to the outstanding work by Nathan O. Kaplan on the transhydrogenases, and his stipulation that there are significant differences between organs that are anabolic and those that are catabolic in TPNH/DPNH, that has been ignored for over 40 years. Nothing is quite as simple as we would like.